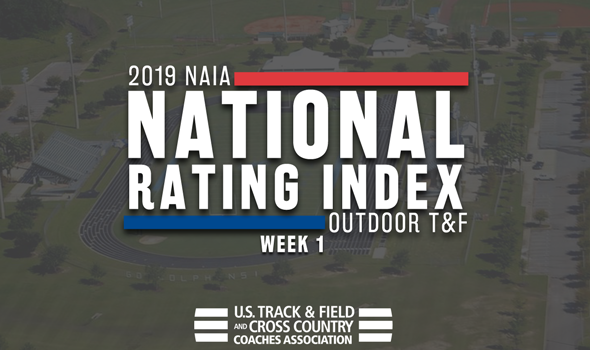 NEW ORLEANS – The first National Rating Index of the 2019 NAIA Outdoor Track & Field season was released on Wednesday by the U.S. Track & Field and Cross Country Coaches Association (USTFCCCA). It’s time to find out which teams are projected to finish on top of the podium when the 2019 NAIA Outdoor Track & Field Championships are held May 23 through May 25 in Gulf Shores, Alabama. The next NAIA Outdoor Track & Field National Rating Index will be released on April 10. Indiana Tech owns the No. 1 spot in the Men’s National Rating Index by a slim margin. The Warriors have a quartet of nation-leading marks: Brandon Smiley in the 200 (20.80), Cayce Griffin in the half marathon (1:08.23), Matteo Madrassi in the pole vault (4.80m/15-9) and their 4×100 relay (40.33). Indiana Tech’s 4×400 relay team recently turned in an effort that has it ranked second nationally at 3:10.66. William Carey (Miss.) isn’t too far behind as the program comes in at No. 2. The Crusaders are led by Malik Crandle, who is ranked first nationally in the triple jump at 15.36m (50-4¾). Dante Brown has proven to be a welcomed addition to the program as a freshman as he is ranked second nationally in the 100 (10.41) and third nationally in 200 (21.43). Saint Mary (Kan.) has six top-5 marks of its own, led by the duo of Philip Lagemann and Luke Skinner. Lagemann is ranked first nationally in the 5000, while Skinner is first nationally in the steeplechase. Skinner is also ranked second nationally in the 1500 and third nationally in the 800, so he definitely has some range. Southern Oregon and British Columbia round out the top-5 at No. 4 and No. 5, respectively. The Raiders have 12 marks ranked in the top-10 nationally, led by Zach Beltz in the long jump and Noah Oreritter in the 10,000, while the Thunderbirds are looking from big things from Roan Allen in the javelin, Alger Liang in the 5000 race walk and Kieran Lumb in the 1500. British Columbia leads the Women’s National Rating Index thanks to a dizzying array of performances so far this season. The Thunderbirds have athletes ranked in the top-5 nationally in seven different event areas, led by the top-ranked duo of Audrey Fox and Trinity Hansma. Fox is ranked No. 1 in the 5000m race walk at 26:23.91, while Hansma is ranked No. 1 in the high jump at 1.72m (5-7¾). Wayland Baptist (Texas) comes in ranked second to begin the season behind a staggering number of top-ranked entries. Devin Johnson holds down two of those in the 100 and 200, while Teresha Jacobs (steeplechase) and Tiona Owens (triple jump) are ranked at the top of their respective individual events. Other top-ranked marks for WBU include the 4×100 and 4×800 relays. Indiana Tech isn’t too far off the pace in third. The Warriors have top-ranked entries in Destiny Copeland (long jump) and the 4×400 relay. Indiana Tech is also paced by Jacqueline Scott in the 200, Leondra Campbell in the 100H and the 4×100 relay. Concordia (Neb.) and Westmont (Calif.) round out the top-5 at No. 4 and No. 5, respectively, to begin the season. The Bulldogs continue to be led by Samantha Liermann and Adrianna Shaw in the field events, while the Warriors are paced by Sydney Marr in the hammer, Chena Underhill in the pole vault and Emily Parks in the 400H.